Fujitsu to sell its handset business – will there be more to follow? Macroeconomic factors of the Japanese economy seem to have influenced the Japanese mobile phone companies to some extent. The aging of the Japanese society progressed rapidly and Japanese companies showed a tendency to avoid big changes. Japanese makers focused more on feature phones, despite the fact that smart phones were already attracting attention. And this tendency of Japanese companies continued until 2016. 2009 is the year the Japanese handset market had finally started to change from a feature phone market to smartphones. Yet Japanese companies did not respond actively. This phenomenon accelerated each year and now the share of smartphones sold among overall handsets has exceeded 90% for the first time during 2017. Of the original 11 Japanese mobile phone companies in early 2000, only five companies, remain including Sony and Kyocera. External changes in the market are important but the response or internal strategies of a company are important factors determining success and failure as well. Japanese companies are building a product portfolio centered on mid- to low-end products, so operating margins are lower than previous generation products. Japanese makers have fallen into a vicious cycle in which they are forced to change their R & D investment more conservatively due to a drop in market share and a drop in sales margin. Considering the needs of customers, investing in the latest technology is an important factor to succeed in the mobile phone business. According to our analysis on model sales, only Sony has a 50:50 ratio of premium and mid-tier phones, while Sharp and Kyocera focus on mid-tier products in the Japanese market. Currently Sharp and Kyocera’s earnings are not bad as demand for mid-end phones has soared since the transition from feature phones to smartphones has been rapid. However, in the a long-term, demand for premium phones may rise as first time smartphone users show a trade-up trend. If Japanese makers do not act accordingly, more may follow Fujitsu’s exit. 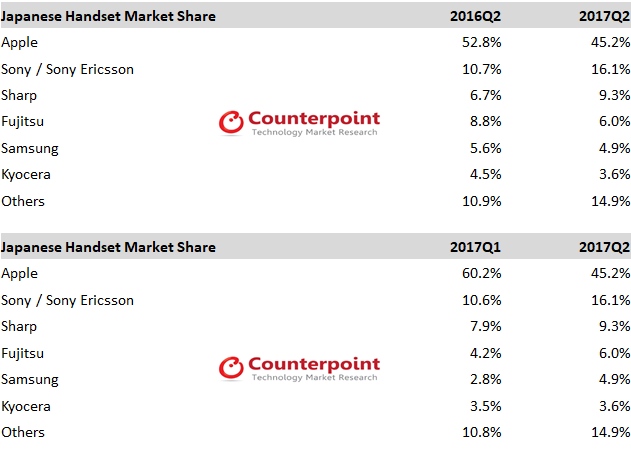 Analysis of the handset market share in the Japanese market clearly shows that the market is changing. In 2016, Fujitsu’s market share in Japan was about 7%, ranking fourth, and Fujitsu’s main products were targeting the >$400 price band. Customers belonging to the >$400 price band will likely be absorbed by Apple, Sony and Samsung. Apple, the strongest player in Japanese market, is also targeting the mid-range market with its iPhone SE and iPhone 6. Failure to fully address all segments of the market will lead to remaining players getting squeezed out almost entirely.